Have you ever gone to the Vatican’s official web site to find something and found yourself praying to St. Anthony of Padua to help you find what you are looking for? Are you convinced the the web designer for Vatican.va is a gnostic and that you need hidden knowledge to be able to navigate the circle of confusion? For example when you saw this icon did you know that this is the link to the various news services? Did you know that clicking on Paths of the Spirit will bring you to spiritual commentary by the saints? Of course the page hasn’t been updated since 18 April 2003 and you have to speak Italian or Spanish to read any of it. You spent hours and hours looking for a homily from the Holy Father only to finally find it but only in a language you can’t read. This of course happens no matter how many languages you can speak. This is because when you select the desired language on the index page the site then makes sure that the majority of links will not be in that language. There was just nothing you could do about until now except to offer up your navigation frustrations. Secrets of Vatican.va will help you to actually find encyclicals, papal bulls, news releases, and the latest speeches or homilies you are looking for. Learn exciting tips like that rolling over some icons will actually reveal the links that they actually go to. Read and you will receive valuable tips, click and you find, knock on the right icon and you will find what you are looking for. Because the Vatican’s site is confusing and the way is hard, that leads to data, and those who find it are few. 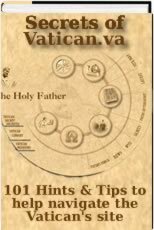 We provide you with 101 hint and tips make navigating the Vatican’s site a breeze instead of a cross. We guarantee after reading our book you won’t know how you ever navigated without it. But wait there’s more! Did you know that there are Easter Eggs on the Vatican’s site? No we are not talking about some Easter Bunny silliness, but hidden features and novelties that web designer incorporated into the Vatican’s site. Just to show you the value of this book we will give you just one example from our 101 hints and tips. First go to the Vatican’s site and select a language. Click on the Pope’ coat of arms an you will be on Benedictus XVI’s main page. 1. Click on the Pope’s mitre and then quickly select the coat of arms. 2. Hold down the Alt key (or Cmd on Mac’s) and select the Holy Father’s ear. 3. Then while performing step 2 say a Hail Mary. Bingo if you have done it right and were contrite while doing it you will see the Pope waving his hand and see the special papal blessing scrolling on the screen. Sorry you will have to buy our book to find out what it is. You will get this tip and much more so why wait? Order now and we will include free of charge the translators guided to Diocesan Spokesman’s Double talk. Operators are standing by! Love the Easter Egg – if only! A colleague of mine put such a thing in the BMW USA web site back in the late 90’s. If you did the right click and keystroke combination, an animated GIF of his spinning head would pop up. Very unique. Your visitors may wish to check out some of the posts related to the Vatican’s web site at The Church Online. They are in the process of doing a ground-up redesign. Speaking of which, I wonder who designs their site. No one is seen coming or going from the Vatican’s Internet Office. 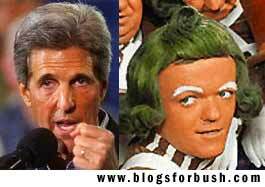 I think they have Oompa Loompas doing the work. In fact, here’s a picture of two of them. The picture explains everything! How about a second collection to hire some competent webmonkeys for the Holy See? Perhaps it’s a bit too ambitious, but can we find someone who can put some spyware on the Vatican site? As you visit, your computer downloads a program that scans your hard disk for pr0n, then tells you to go to confession. Well, of course, AK. The Vatican web site, like the Word of God, and absolute truth, never changes. This is perfect! I’ve never been to such a confusing site … so the next time it will be perfect that I’m laughing the entire time thinking of this post. Tony, that warning is implicit whenever you visit this site. You really nailed this one, Jeff! I’ve never had success looking for anything at the Vatican’s site! I’m so glad I’m not the only one who finds the Vatican website hopelessly confusing. Usually when there’s an encyclical or whatever I want to read, I just google it and read whatever link shows up first. Walking in the “front door” of the Vatican site and trying to just find what I’m looking for by patiently clicking the right button (whichever the heck one it is) is immensely frustrating. Perhaps that’s why I look at it so rarely! Ha ha! Yeah, I seem to remember that it looks a lot nicer than it did five years ago or so, but it’s still about as confusing. One of my favorite techniques to find something is to skip the built-in search engine and use Google’s advanced search with the domain restricted to “vatican.va”. You know what? I just like this post by Jeff for the fact he has B16 waving at all of us. Is that cute or what? Great picture!!! I thought I was the only one who couldn’t navigate the Holy See’s site! What DO those pictures mean? I have to scroll on them to see what they are. And, I was told that there is an online store where I could purchase Rosaries for my children. Where??? If only this were true, Jeff. If you figure it out, you could make millions. I just do what others do: Google it and click on a reliable link to EWTN or the Vatican. Going there myself through the homepage makes me feel too much like an idiot.